Project Watershed has a mission—to protect and conserve the local watersheds within the Comox Valley. Since the conception of this non-profit environmental society in 1993, the watersheds between Deep Bay Creek and Oyster River have been the target of a number of projects designed to restore the health of our local waterways. Much of the work currently being done is in the K’omoks Estuary, specifically in salt marsh restoration. Staff biologist Jennifer Sutherst and Technical Director Dan Bowen provide insight into what exactly salt marsh restoration is, and why it is important at this time. 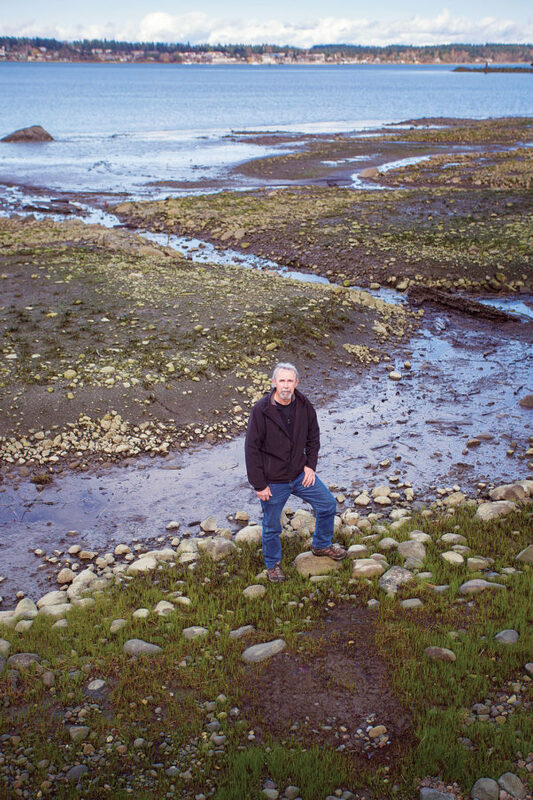 “We’ve lost over 50 per cent of the salt marsh habitat in the estuary,” says Sutherst. “The reason we need to restore it is because it has been negatively impacted by the logging industry. Log booms shaded out the sun and the plants under the water could not grow. Then, when the tide went out, the logs would crush the plants. Not only that, but the motion of the waves would move the logs against the rocks and actually grind away the plant matter along the shores. Bark from the logs would also come off and create a barrier, smothering any plant life that was left. This log action, along with foreshore development in the form of sea walls, man-made dykes, breakwaters and boat ramps have also negatively affected and even destroyed much of the coastal habitat in our area. “There is literally not one square metre of the estuary that has not been impacted by residential, commercial, or industrial activity,” says Bowen. Imagine, Bowen says, being a fish and swimming between the mouth of the estuary and Condensory Bridge, which is considered the top of the estuary since the tidal movement extends that far up the Puntledge River. This journey would pass the walls of cement under and around the 5th Street Bridge, steep and high banks with little vegetation, patches of sparse aquatic plant life on the rocky shores where swimmers frequent, and seals lounging along the river, satisfied after their easy snack. “Research has shown one of the bottlenecks where there is a lot of mortality of juvenile salmon is in the estuary,” Bowen says. Sutherst speaks of the “Salmon Highway” they are trying to re-establish—the area along the shoreline that has three unique ecosystems. There is the sub-tidal, the inter-tidal, and the foreshore zones. Different species live in the three zones, and each zone has its purpose in the entire system. For example, juvenile salmon as well as adult salmon who return to spawn feed on the foreshore insects and take shelter in the eel grass. Eel grass planting has been a focus for Project Watershed since 2011. The process involves harvesting donor stalk from healthy areas, being careful not to over harvest, and then transplanting the eel grass to barren areas. Building up the eel grass population creates what Sutherst refers to as a “Triple Win. “It creates habitat for invertebrates, fish and birds; it protects the foreshore areas by preventing erosion and buffers the areas basically to deflect wave energy, and it sequesters carbon,” she says. Marine plants have been found to be a more suitable plant to sequester carbon; when they break down they are able to continue storing the carbon long term due to their environment. Cutting-edge research measuring levels of blue carbon in marine plants is underway at Project Watershed, and more information about the process can be found online. While eel grass is part of both the sub-tidal and inter-tidal zones, salt marshes are part of the foreshore zone. Salt marsh plants are unique in that they are often inundated with saltwater, and they are “very picky about their elevation,” notes Sutherst. “You have to be careful. Some like their roots in [the sea water] all day. 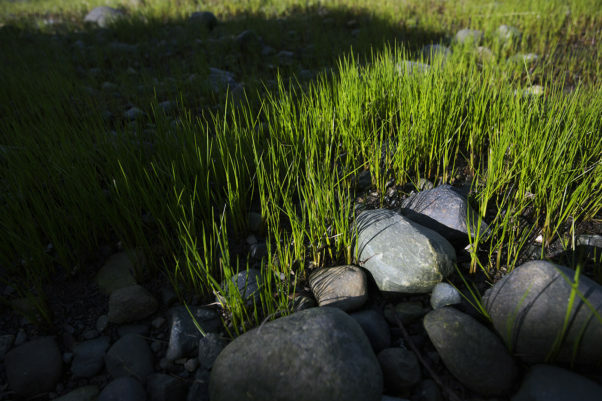 Some prefer to be higher up and drier.” These plants help to anchor sediment so that the shore does not erode away during tidal and wave motion, as well as providing shade, shelter and food. Salt marsh restoration is underway in two different locations in the estuary. The first of these is near the Royston Seaside Trail. This site was chosen because of the damage that the site has incurred historically, and because it is close to eel grass restoration work already underway by Project Watershed. Royston is “not re-establishing,” Bowen says. “We had to give it a helping hand. Bowen is referring to their inventive approach to salt marsh restoration. What has traditionally been done is called a “bench technique,” where the shore is essentially extended by building salt marshes out from an existing shoreline. This can impact existing vegetation, and is not always ideal, so Project Watershed has come up with a completely new technique. “What we did is we built three islands, which creates more tidal channels, which the fish like,” Bowen says. These three islands were built at the Royston site, and two more were built at the Airpark site. Salt marsh islands create 360 degrees of edge habitat for the fish, and there is no impact on existing shoreline vegetation. A hydraulic engineer was hired to determine hydrology (wind and storm events). Based on the data collected, the islands were designed in a way that they could both withstand storm events and support vegetation. Even the exact size of the rocks was determined from the analysis. The islands in Royston, which were constructed in September and October of 2014, survived the winter storms and were planted in the spring of 2015 to “coincide with the start of the growing season and suitable tides” Sutherst says. “We have a nursery that grows salt marsh plants,” she adds. The ecologist is given a list of plant species that are needed. He then harvests from the wild in a sustainable and healthy way, and replicates them in order to plant in the salt marshes. Seven species were chosen for the planting at the Royston site, among them are Seashore saltgrass, Lyngby’s sedge, American bulrush, Oregon gumweed, Sea plantain, Sea arrow grass, and Sea asparagus. Project Watershed invited teachers of the Royston Elementary School to join in when planting the salt marshes along the seaside trail. They were surprised and happy when the entire school responded with interest. Last spring 190 students, plus teachers and parents, were on the shoreline planting the salt marshes. “They are stewards of the future,” adds Sutherst. “We want to nurture that connection.” This spring Royston Elementary School was presented with Project Watershed’s “Keeping it Living” Award. At the same time their new “mascot” was revealed—a green and blue newt caricature. The second salt marsh project, located at the Airpark, has already seen beneficial results. The site, which was artificially dyked off in the 1960s, was opened again by inserting a culvert from the river to the lagoon when they were building the islands. “They fragmented the habitat,” Sutherst says. “It’s important to note that historically the channel was there.” Now that the river can flow into the culvert, there is better nutrient supply and the water no longer becomes stagnant with high temperatures where fish can’t survive. There is better circulation and the area has been returned to its natural state. “We’ve restored the natural habitat for the fish,” says Bowen. Last fall Coho spawners were seen in the lagoon, and they have never been seen there before. “It’s definitely coming to fruition as we had hoped,” Sutherst says. They both point out the increase in birds such as kingfishers and Great blue herons in the airpark lagoon—an indication that fish population is present. “That was a really exciting job for me as a biologist because often you’re waiting [and] five years down the road [you see the results, but here] the results were almost immediate,” Sutherst says. With their holistic approach and success in obtaining grant funding, alongside knowledgeable and trained staff who bring a variety of backgrounds and experience to the table, the Comox Valley Project Watershed has begun to make a name for itself. Bowen has also been asked to give presentations at Fisheries and Oceans Canada, as a framework for what they would like to see and support. The work that Project Watershed is doing is well respected and recognized as valuable, unique and effective. Moving forward, Project Watershed is hoping to restore areas of Mallard Creek, the Dyke Slew, Simms Park side channel and the Field’s Sawmill site. While the first three locations are under the City of Courtenay’s jurisdiction, the Field Sawmill site would need to be acquired for restoration. For more information about Project Watershed, their current restoration projects, or more on blue carbon visit projectwatershed.ca.